The Alexander Hamilton is currently being done only for City Tavern. It's currently Philly Pale. It's on the shelf as an R&D beer. It's status as a new addition is still up in the air. Well that certainly clears things up a bit, though I'm not sure what the "It's currently Philly Pale." means. Is he referring to Yards' standard Philadelphia Pale Ale? 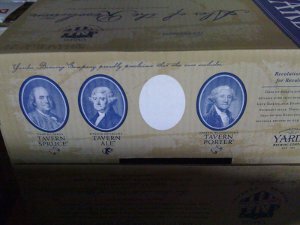 Is Federalist Ale the same beer? Or is it a slightly modified version (BA has the ABV as being slightly different between the two beers, if that matters). I guess the fact that it's a R&D beer explains a lot of this, including the different names and classifications. I suppose some specifics in the screenplay I wrote are technically wrong, though I'm sure you'll understand that realism wasn't exactly one of my goals in writing it. Heh. There is actually a label made up for this beer. If you go here (http://www.lcbapps.lcb.state.pa.us/webapp/registered_brands.asp) and type in "ALEXANDER HAMILTON'S FEDERALIST ALE" in the Brand Name search you can request to have the label emailed to you. The version I received is in black and white and the description on the side is hard to read. Thank you for this blog post! I often wondered about this beer myself. I'll have to make my way to the City Tavern to taste this for myself. Thanks for the pointer and good luck on your City Tavern quest! Hi, my name is Mark, and I like beer. You might also want to check out my generalist blog, where I blather on about lots of things, but mostly movies, books, and technology. Email me at mciocco at gmail dot com. This page contains a single entry by Mark published on February 2, 2011 10:23 PM. Sly Fox Incubus was the previous entry in this blog. Double Feature: Stouts is the next entry in this blog.